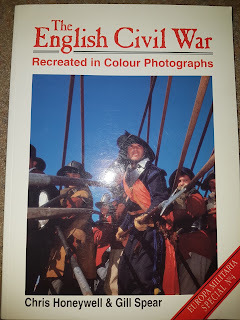 The English Civil War in Colour Photographs. I find that it is all too easy to become jaded and lose focus when trying to paint 'uniqueness' into a painting block of 30+ infantry figures. Napoleonics are easy, especially if you go for the box fresh parade ground look (which, let's be honest, is the big appeal of Napoleonics) as everybody is exactly the same. Random trouser colours, and shades of red coats? All too easy to slip into formulaic convenience for speed. The English Civil War in Colour Photographs by Honeywell and Spear is a gem of a book. It really helps give inspiration for the 'variations on a theme' notion of colours. Plus it is a pretty good starting point when picking out colours for your palette: what colour for the funny little bottle on a musketeer's bandolier, for example. For those just starting out with an ECW project, the eye candy inspiration is second to none. The authors have followed Sealed Knot and ECWS reenactors at various events, taking pictures to tell a story about a battle during the Civil Wars. There is little text, mostly descriptions of the pictures, and the barest of narrative - this is first and foremost a picture book. Available for under a fiver posted (usually) from online auction sites, or more reliably ABE Books and Caliver.